Hi friends in this post i am sharing what is a domain name but a little bit explanation. In general domain is called as an area controlled by a person.In the internet industry the domain name is used to identify a website.In technical,a domain name refers to an IP address(internet protocol is called as IP).Let us say with an example,You want to have see your friends house and you have the address like Door No 131232434. It is difficult to remember this number.But if your friends house has a name like "Jack house" .It is easy to ask and search for you. created which was connected(or "mapped") to the ips.User can enter the site using a domain name ,when he enter the domain name the web browser converts to ip adress where domain name connected or mapped to ip address will be processed and it will show the website.Here the another important point is Domain name and URL are related to each other but not the same. "." is called trailing dot separator .Trailing dot is the separator between toplevel domain and other labels on left side. 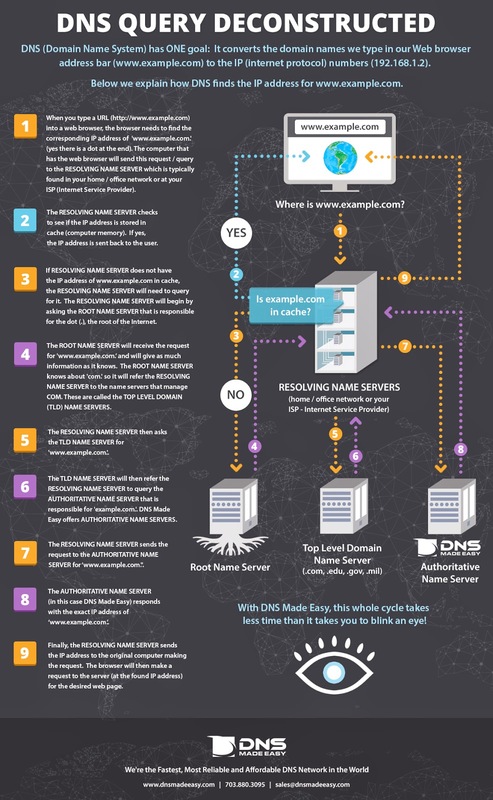 Full credit for this infographic -http://dnsmadeeasy.com . Here we gave for information purpose only and this infographic is awesome. From the infographics what names you can understand? What are the important terms you should also read in domain names? Domain name is the unique name that you register for your blog or website. It consists of a second level domain name (the name that you select) and the top level domain name (required extension) and altogether it constitutes a complete domain name. You can register required name for your site from number of domain name registrars. But, it is advisable to go for trustworthy ones.